April’s theme: Treasured Cookware – Share a story of classic cookware – and a healthy recipe to go with it. Some of us will be celebrating Mother’s Day next month (May 11,) but it’s more than once a year that many of us cook with a pan, a wooden spoon or another piece of cookware passed on to us from the kitchens of our favorite relatives. Let’s see what you can cook up with your treasured kitchen tool! 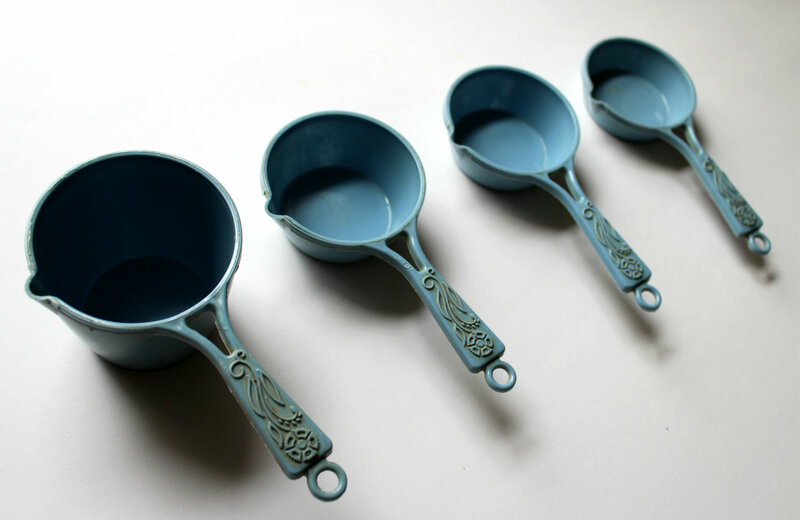 One piece(s) of cookware I love and always use are our old blue measuring cups. You can’t even see the measurements on the inside of the cups, but there are only 4. 1 cup, 1/2 cup, 1/3 cup. and 1/4 cup. I love them though and I would feel so bad buying a new set. I think they are so cute and vintage, haha, hipster foodie right here 😉 Well, I use these guys everyday. For measuring grains, flour, or whatever. And of course I always use them for PANCAKES! And what better way to use these measuring cups then with a Spring inspired pretty pancakes recipe? Spring is full of beautiful colors and nature is finally becoming a bit more happy and bearable. Hopefully not all the flowers have died due to this crazy winter. 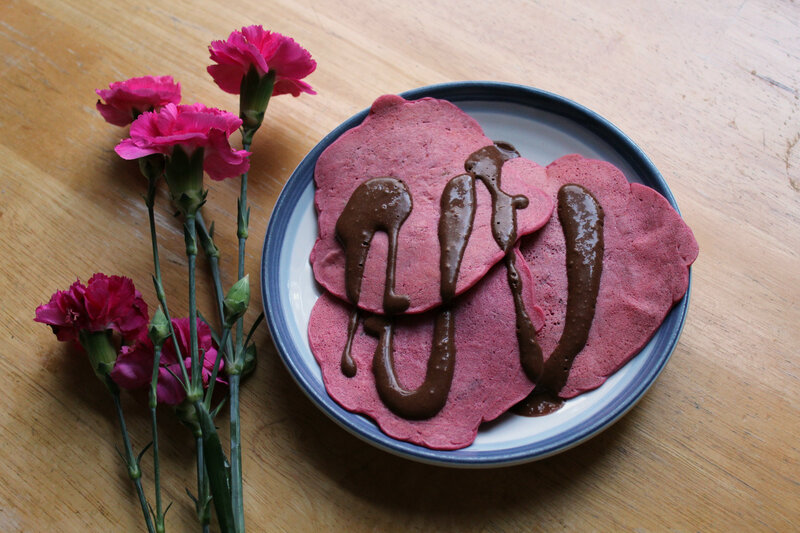 Let’s stay positive though and just enjoy these pink pancakes. You know what is also great? Natural coloring. From veggies! Yes, more veggies for breakfast. I though using purees was the best way to go when making vegan pancakes, but I am loving using grated veggies instead. 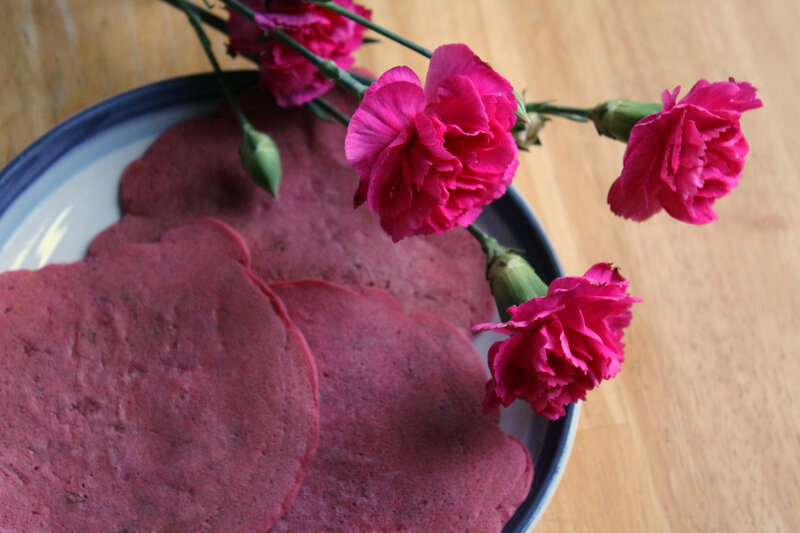 These pink cakes contain zucchini and wonderful raw beets! I love beets so much! I used to bake them, but the last few months I can not get enough of them raw! So crunchy and sweet, perfect in salads, and dinner bowls. 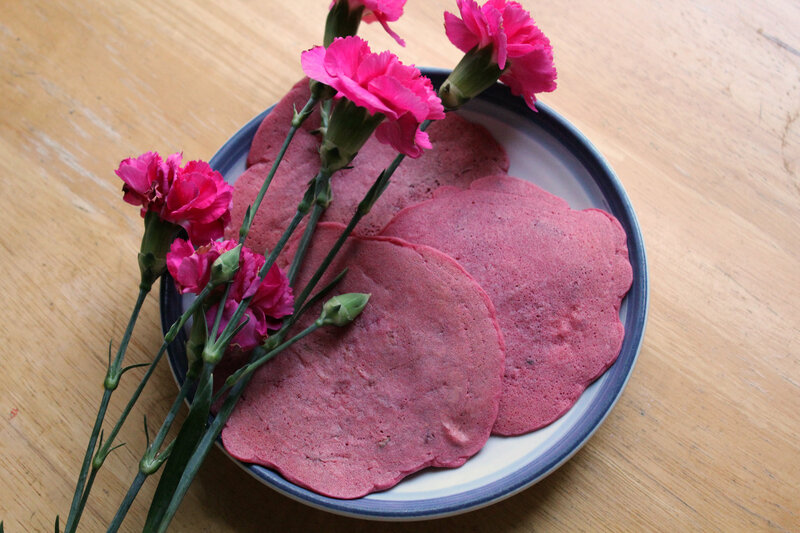 I also wanted to use a light colored flour for these pancakes instead of my usual buckwheat. 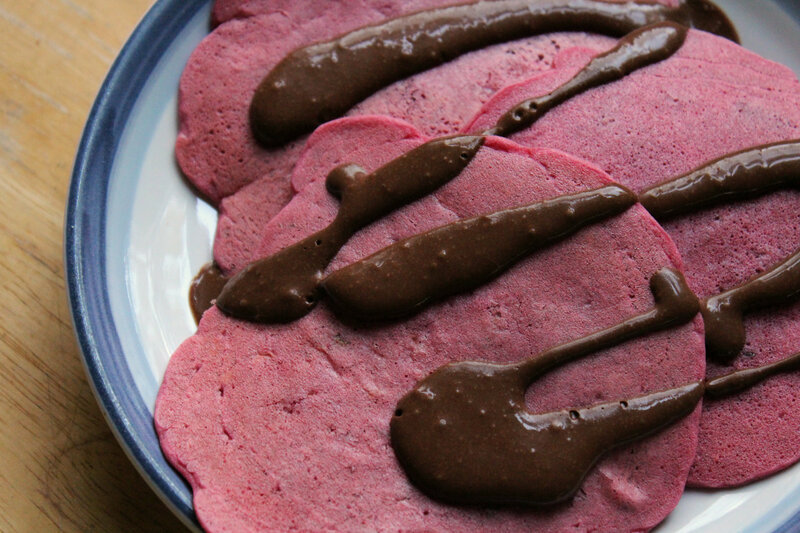 So I went with that new millet flour and it really let the beet pink color shine! + Mix the flour, egg replacer, and baking power in a bowl with a fork. Then grate your veggies add them in along with all the wet ingredients. Stir! + Wipe some coconut oil in a pan and heat over medium heat while they pancake batter sits. + Once the pan is hot, reduce the heat just a bit and pour about 1/3 of the batter in the pan. Cook for about 3 minutes, flip and cook for another 2-3 minutes. Repeat for the rest of the batter. + For the sauce, just mix all the ingredients in a tiny snack bowl. Add more of less liquid for the consistency of you liking. So pretty! And hey, these would be perfect for Mother’s Day or Easter….if I wasn’t late on that bandwagon 😉 Whenever you decide to make them (and I hope you do!) I can bet you will feel pretty and pink just like I did (yes, you can feel like a color)! The next colored pancakes on my foodie list to-make has got to be GREEN! Spinach pancakes anyone? 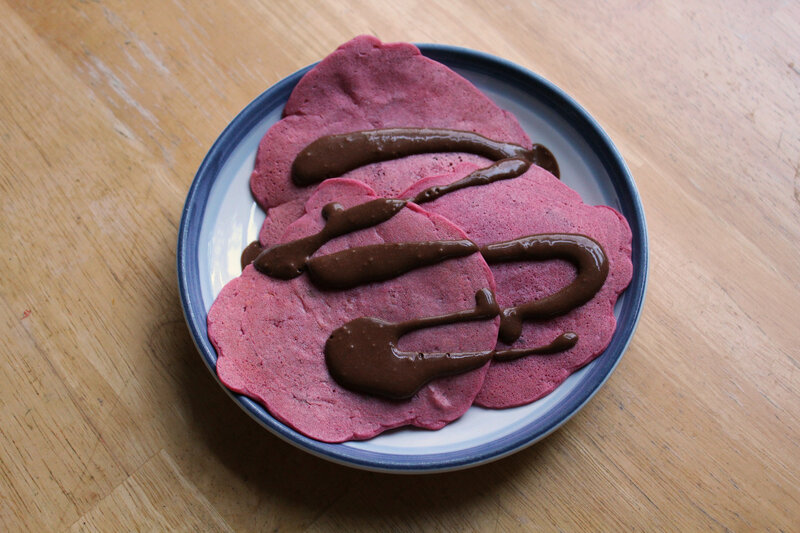 What is your favorite pink/red food? BEETS! Have any vintage cookware you love? Do you use chemical filled food dye? No! But there was this weird period of time in 5th grade? when my friend and I would drink glasses of water with food coloring in it. We would sneak in her kitchen and make weird colored water with different colorings…so gross! Make sure you check out the other Recipe ReDux members recipes for this month! Just click the linky button below to bring you to the link-up page!